The strip started as a replacement for Frank Merriwell’s Schooldays, an essentially identical strip. I’m guessing the syndicate (Central Press Association) decided that they could just as easily do the same strip without paying the licensing fees for this well-known dime novel character, and thus Frank Merriwell ended on 7/14/1934, and turned into Chip Collins on the following Monday. For more on Frank Merriwell, try here and here. The strip was written by William Ritt (who may well have written the Frank Merriwell strip, too, but credit on that was given to “Gilbert Patten, the original Burt L. Standish”. The art was by Jack Wilhelm, a good cartoonist who was especially adept at depicting lovely ladies. Unlike the Merriwell strip, Chip Collins got a Sunday version in addition to the daily. I say Sunday, but actually you’ll find that these strips are dated on Saturdays. This is because they ran in the New York Journal, Hearst’s second New York paper (the major Hearst strips ran in the Sunday New York American). 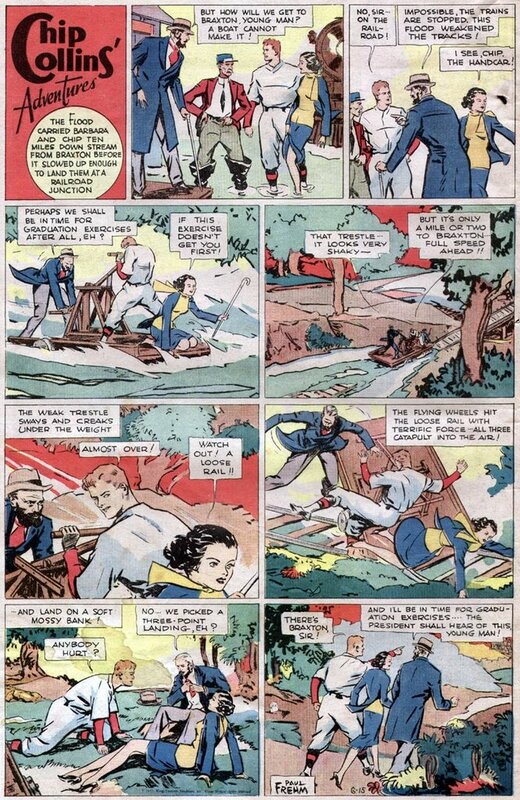 The Journal published a color comic section as part of its Saturday edition. Whether it was because of the loss of the Frank Merriwell name, or the stories and art that often seemed rushed, Chip Collins had a short life. The Sunday (er, Saturday, okay to heck with that, I’m calling ’em Sundays) was killed as of the 6/15/1935 episode, and the daily ended 7/27/1935. 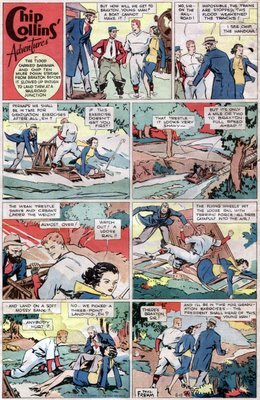 Both episodes tried to wrap things up in their final panels, as seen above. A few items of note on these strips. Notice on the daily that the final panel is obviously not by Wilhelm. My guess is that the original version of the strip continued the storyline, so a bullpen artist was called on to redo the last panel as a series wrap-up. On the final Sunday note that the art is by Paul Frehm rather than Wilhelm. Unfortunately I don’t have the Sundays leading up to this, so I don’t know if Frehm took over earlier or just did the final installment (my next to last is 2/9/35, and Wilhelm was still credited there). This may be the key to why Chip Collins ended – was Wilhelm just too overwhelmed with the work? The art does certainly look rushed on much of the Chip Collins run. One final note before I let Chip Collins recede once more into the collective memory. The New York Journal sometimes (often?) dropped the Chip Collins Sunday for an ad. Given that the Sunday was not widely syndicated, if at all, was the Sunday even produced in weeks that it didn’t run there? Does anyone have Sundays from other (non-Hearst papers)?